DR. PATRICIA SCANLON: Hi, this is Patricia Scanlon, and I’m the founder and CEO of Soapbox Labs, and this is your Assistive Technology Update. JOSH ANDERSON: Hello and welcome to your Assistive Technology Update, a weekly dose of information that keeps you up-to-date on the latest developments in the field of technology designed to assist individuals with disabilities and special needs. I’m your host, Josh Anderson, with the INDATA Project at Easter Seals Crossroads in beautiful Indianapolis, Indiana. 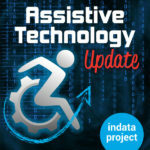 Welcome to episode 408 of Assistive Technology Update. It’s scheduled to be released on March 22, 2019. On today’s show, we are very excited to have Doctor Patricia Scanlon, the founder and CEO of soapbox labs to talk about voice recognition for children, and how that works. We have a pretty cool story about some accessible gaming devices. We also have a neat story about virtual reality and using it in some mental health situations to help folks out. We are also looking at to have Amy Fuchs from BridgingApps to talk about the Hoopla app. We are excited to have the show coming out during disability awareness month. I’m pretty sure that folks listening to the show are probably more aware of disability than other folks in their everyday lives. But it is a good time to think back and try to make sure that we are good at talking to folks about disability, about how we work with disability, maybe how to work with individuals with disabilities, using people first language, all these different things that folks who don’t work in the disability community or live in the disability community don’t know. It’s not so much that they are mean or bad people, they just haven’t worked around folks or been in the community for so long that maybe they just don’t know some of the social norms or the things of the disability community. It’s good that awareness can be raised during this month of March, not only that, I found out that next week, on Wednesday, March 27, is designated as national assistive technology day. Very cool and very excited on this show. To Barry come out on Fridays, Wednesdays. Tell your friends about the show and they can listen to and check it on national assistive technology day. Will have them check out your state tech act or something else to show them what technology can help individuals with disabilities is all about. I’m very excited that assistive technology gets its own day this year. Wednesday, March 27, will be assistive technology awareness day. You can always use the hashtag #ATawarenessday define a simple things going on about that. We are very happy that you chose to join us today, so let’s get on with the show. Are you interested in spending a day learning more about web accessibility? Join us for our web accessibility for developers 2019 webinar where you can join renowned web accessibility professional Dennis Lembry for a full day of training this webinar training begins with the background on disability, guidelines and the law, the many techniques for designing and developing an accessible website are explained. Basic through advanced levels are going to be covered. The main topics include content structure, images, forms, tables, CSS, and ARIA, techniques and writing for accessibility, and testing for accessibility will also be covered. If you are involved in web design or development, you don’t want to miss this wealth of practical knowledge. This is a completely free webinar, but you do have to webinar for it online. The webinar will take place on May eighth, 2019, from 11 AM to 4 PM. For information or to register, go to EasterSealsTech.com/A11Y. We will go ahead and put a link to that in our show notes. We have a couple of different virtual reality systems here at Easter Seals Crossroads. We use them for different purposes got some time for simulation, to see what it’s like to have different disabilities, different processing disorders. Of course there are fun games and things like that. But we are starting to see virtual realities and these headsets becoming more useful in assistive technology. When I first put the headset on when we very first got it, one of the simulations was is like you are on the side of the building. You can look down and over and it feels like you were way up high. I almost knocked over the shelving unit in front of me the first time I put this on because I was reaching for something to hold onto because I was afraid I was going to fall. You are probably thinking, “Josh, that’s great. Things were telling us all these wonderful things.” I don’t have a rational fear of heights, but I deafly don’t like being on a ladder on my roof anymore than I have to. I found a story at Healio.com, and it says, “App-based virtual reality therapy reduces acrophobia symptoms.” Acrophobia is what you think of as the fear of heights, the irrational fear of heights, debilitating pretty much. This just talks about a low cost, self-guided smart phone app that is based in cognitive behavioral therapy. You put it into these cheap cardboard goggles, and the person uses this. It can be used to help treat their acrophobia. In reading this story, this is one study, so you can always say that it definitely works because of that, but really, in looking at this, that’s a great way to do some different cognitive behavioral therapy. You’ve got to think this person could even do this at home on their own phone, or maybe even remote while talking to the therapist. Here in Indiana, and I know a lot of other places, there is a major shortage of folks that give mental health assistance. Something that you can do on your own or that you could maybe set up participants and not have to be there with them in a full 2 to 4 hour meeting could really free up some time for those folks to work with other folks. It does say that these people that use this app use these headsets, did over a three-week period, and it’s an immersive VR environment for 360 degree videos. They use gaze control to navigate through these environments. It shows on their followup that they did show a significant reduction in acrophobia symptoms at three months compared with the control group. Very cool. What I really like about this story is to see where that can go. Where else can virtual reality be used to help? I could think PTSD. The sky is the limit on what could help. Social skills, all different kinds of things could be helped by this virtual reality. It could also really assist with the shortage we have on service providers and staff. I will put a link to that in the show notes cup of very cool. I’ll be excited to see where that will end up going. Moving on from virtual reality, on into accessible gaming. Accessible gaming we talked about for a little while, and I know it’s been a bigger thing, especially with commercials and things like that. I know we’ve talked about different accessibility features that are being built in. I found a story over at PCMag.com by Benj Edwards. This is talking about gaming for everyone, seven accessible gaming devices. It talks about something that you may have heard of or have seen before, just think of some different access devices, alternative input devices, that we use for computers all the time. Of course, it talks about the Microsoft Xbox adaptive controller that I know a lot of us have seen the commercial, and I think we’ve talked about here on the show. It talks about Blue Tip Gaming Axis 4 Pro and some different devices made by Blue Tip gaming out of Ohio. One of the cool things that I had never seen before and didn’t really know about was the SubPac M2X. This is for gamers who might be deaf or hard of hearing but want to experience the full depth of video games. This device is like a backpack, maybe a vast, and you wear it over yourself and it translates game audio into tactile thumps and vibrations. It actually said that every detail is transmitted so well that talented gamers can reportedly even play musical rhythms games with this device. I thought that was really cool, that something you don’t always think about and something I personally had never seen before. Very cool, and I’m going to try to look into that more and see how that works. Some of the things, the Optima Joystick, which I know I’ve used for a computer and other stuff. It talks about the Tobii Pro Glasses 2 and Nano, so using eye gaze technology in order to control things on the screen. I had never actually tried to set up a system like this on an Xbox or PlayStation or anything like that, but I have set systems similar to this on computers, so I could see how it could be used for computer gaming. I’m sure with some tweaks in other situations, you might be able to use it on a game console as well. Very cool cut telling people to use that. It also talks about someone named Ben Heck and just some different Xbox and other controller modifications that he has made. It has a link to his website, just because some of those things might be available. But also the QuadStick FPS Game Controller. QuadStick out of Minnesota has made a control device for individuals with quadriplegia that combines a mount actually do joystick with sip and puff switches. This could allow folks to play even really complex games on Nintendo switch, Xbox one, PS4. They have tons of different models, tons of different mounting systems as well. Kind of a neat story. Like I said, a few of these devices, I didn’t even know was out there. I guess you can’t know everything about assistive technology. One thing – and a big kudos definitely for the writer — there is one part that it does say that while people do have different needs, different abilities, there is no prerequisite for joy, no physical requirements to have fun. I thought that was very cool and very well written. We will put a link to that over in our show is. Please join me in welcoming Amy Fuchs from BridgingApps to the show to talk about the hoopla app which allows folks to borrow books, videos, and music using just the library card. Take away, Amy. AMY FUCHS: This is Amy Fuchs with BridgingApps, and this is an app worth mentioning. This week’s featured app is called hoopla. Hoopla is a free app that allows you to sign in using your local library card and then instantly borrow music, movies, audiobooks, and more. It is awesome. When you create an account by setting in with your library card, you are then eligible to borrow up to five items per month. When your time is up with an item, it automatically returns to library, no more forgetting to return something and building up pesky late fees. The app is very simple to use. From the My Hoopla page, you can see the items you currently have checked out, your recently returned items, and how many titles you are eligible to borrow for the month. To check out a new title, simply choose the area you want to explore, video, music, or books. Within books, you can choose audiobooks, e-books, or comics. While you are looking around, you can click on the heart icon to say titles that you are interested in borrowing. These are saved in your favorites on the my hoopla page. When you find the item in the format you want to borrow, click on “borrow”, and it is yours. You can then choose download to your device so that you can listen and/or watch the item off-line. This is great if you have a child using it with an iPad that does not have cellular service. Just download it and they don’t have to be connected to Wi-Fi to enjoy their book. The hoopla app can be very beneficial to those who are blind or visually impaired, but still want to enjoy a great book. They are read by narrators who use inflection and emotions. Or for children and adults with dyslexia who want to be able to experience an adventure without having the stress and fatigue that often come with reading. Hoopla is available for free at the iTunes Store and Google play store, and it’s compatible with iOS and android devices. For more information on this app and others like it, visit BridgingApps org. JOSH ANDERSON: When it comes to speech recognition, we’ve come a long way. Many devices, games, and assistive technology can now be controlled by a voice. This voice-recognition is usually made for adults and adult voices. But what about children’s voice-recognition? Our guest today is Doctor Patricia Scanlon, the founder and CEO of soapbox labs. She’s here to talk about everything. Welcome to the show. DR. PATRICIA SCANLON: Thank you for having me, thanks for the invite. JOSH ANDERSON: Definitely. Before we start talking about soapbox labs, can you tell our listeners a little bit about yourself? DR. PATRICIA SCANLON: Sure. I have been working in the area of speech recognition — I started out as an engineer. I’ve been in the business in this area for 20 years now — back doing a PhD in speech recognition 2000, back before it was a big hit, a big thing. It was very much focused, small, wasn’t very accurate. But we were working very hard on it, and the people working in this area for 50 years. I did a PhD in speech recognition, I ended up working in places like Columbia University, IBM research. When I finished my PhD, I went down to work for seven years at Bell Labs, and that’s Nokia Bell Labs now. And then in 2013, after spending a very long time in the area of speech recognition and seeing where the area was going and how important was technology as an interface was going to be, not just as assistants, but bigger than that as an interface technology, I realized that nobody was really focusing on children speech. My whole career, I had worked on speech recognition, which was in fact just adults speech ignition. I had young kids myself at the time, so I began to see them interact with tablets and smart phones and seeing how useful it would be for young child to interact with technology with their voice, more than an adult, or people who don’t have complex, mature thinking or dexterity, physically speaking. So it’s not just children, and this is why we are talking about assistive technologies as well. You can suddenly — your eyes get open to the fact of how important this technology is. Yet, nobody was looking at it. JOSH ANDERSON: I think that leads us right into soapbox labs. Tell our listeners all about it. DR. PATRICIA SCANLON: In 2013, I left Bell [INAUDIBLE] because as I bigger need, I saw where was technology was going. It was going to be fairly mainstream technology. I had seen lots of demonstrations and prototypes of voice assistants. When I was looking at my daughter interact at a very young age with technology, I saw the potential, more so for children and more so for people with assistive needs than I did for adults. It’s kind of more of a utility for adults, convenient, can be fun, make sure life a little easier. But it can be so much more for children and people with disabilities as a means to interact with technology. As a result, I started looking around about why is it not therefore children already? What is the problem? Why do we need — why has the focus been an adult? This is like their voices are so much different under the age of 12. Their behaviors are different, their vocal tracks are thinner and shorter. You take an off-the-shelf product that’s built for adults, of course it’s not going to work for kids. Of course when you go under the age of 12, and the younger you get, the performance is going to get worse and worse. It all started to come together in my mind, that this was a need and a gap. Knowing that it was going to be such a big technical [INAUDIBLE] I figured I would start my own efforts in this and build a really experienced team. It’s 2019 now, six years later, in the industry has woken up. It has woken up to how important this is. It’s a great way for soapbox labs to be — we are one of the most accurate assistants in the world. I have yet to find a system that is more accurate than hours for children. We’ve benchmarked against all the big multinationals and what they do. We’ve benchmarked against every other company that is attending to do what we do for children. We are by far the most accurate. With good reason, because we focus, and focus is what’s gotten us to the stage where it is as accurate as it is. JOSH ANDERSON: I know with a lot of different speech recognition tools, how does yours learn to become more accurate? DR. PATRICIA SCANLON: It generally was focused on the fact that children speak differently. We’ve committed thousands of hours of data from children in the real world. In full compliance with GDPR — we were very cognizant of those data privacy needs from the beginning. What we strove to do — let me phrase in this way. What traditionally had been done around children’s speech was you get a university group that would collect some data from children, or you get people to physically go out to collect data from children, and they would build models on this kind of control data, I would call it, clean, controlled data. Then they expect it to work in the real world in a [INAUDIBLE]. We use deep neural nets, state-of-the-art speech recognition technology. You need large volumes of data. What we decided to do was allow children to act naturally when they interact with technology using their voice, and then we take that and build our technology based on that. We don’t try to get the children to conform to how we want them to speak to a machine. That’s how you don’t get very accurate and robust systems. We decided to let this naturally build up our data set and then build our technology that works on their voices and models their behavior. It’s constantly learning and evolving our system. It’s amazing – but we are leveraging state-of-the-art technology to have it work in very accurately for children across the globe. We recognize that in New York City, London, or California or the Midwest because you’re never going to have just New York accents. You’re going to have accents from all over the world. Why build a specific northeastern accent speech recognition system? That’s not how the world works anymore. We decided to go broad and diverse and really build our system to work for all children. JOSH ANDERSON: Will this system work on anything that is voice controlled, apps, devices, and everything? DR. PATRICIA SCANLON: Yes. What we do is we are just the engine. We are the smart engine inside. We deploy our technology via an API, a cloud-based API. We also have an off-line version available as well. What we do is voice enable any product for children. You could have a toy, a robot, a game, an app, or service. Our clients integrate our technology into their product very easily. We’ve made it pretty easy. They just send us an audio file, very simple code, and we returned near real-time response to what was being said. The developer of that product will then use that feedback to trigger an event within their product or respond to the child or respond to an adult — whatever it is supposed to do. We voice enable that product. JOSH ANDERSON: A lot of kids learn differently, speak differently. Could this technology be used for speech assessments? DR. PATRICIA SCANLON: Yes, exactly. That’s exactly how. One of our first application areas was education. Unbeknownst to us, we went after it because we saw there was a need for literacy and language learning. When we started, we actually set ourselves a really high bar because for education, anything around education, you can’t be hit and miss. It can’t be 70 percent accuracy. It has to be a lot more accurate than that. We went after that first. And it performs assessments. It will verify how well that child pronounced that word. It will give a confidence score right at the phonetic level of how they said that. That’s very useful in early literacy and language learning. Equally, we respond to the child itself or to the assessor, it could be a parent or teacher or speech therapist, a variety of different people interested in the outcome. JOSH ANDERSON: I know some kids react better to an app or device or something like that and always talking to an adult. It might get a little bit better assessment and find out how they speak. That’s very cool you thought to put that in. JOSH ANDERSON: I know a lot of voice recognition, any kind of dictation, usually you need a quiet environment or noise canceling headsets. Is yours able to work — kids are always in noisy places. I’ve never known kids to like quiet spots. Does yours work in the noisy environment and things like that? DR. PATRICIA SCANLON: Exactly what you just said. That’s one of the things I noticed. I have children myself, so that’s one thing I noticed. They don’t tend to go off to a quiet room. What four or five or six-year-old will go to a quiet room and do anything on their own? Again, as much as I wanted this technology to work as children interact naturally, using their voice with technology, I want it to work in real environments. There’s always a limit to that. We say within reason, you can’t have people screaming right beside the microphone. But background noise is perfectly acceptable. You have TVs in the background, adult conversations, other children, restaurants and cars and outdoors and indoors. It’s very much part of the data that’s built to identify what’s noise and what’s not. In that way, it can be truly useful. It can be useful in the home or the school. That was the goal. Again, we set ourselves a pretty high bar in that, but I didn’t think there was any point to bring that technology that didn’t work in those environments. JOSH ANDERSON: Yeah, because like you said, if it’s not going to work in a loud environment, why even have it? Can you tell me a story or some situations where this has been used? DR. PATRICIA SCANLON: We have a number of partnerships going on at the moment right now. It’s in a product in English language learning in Asia. We will be doing an announcement about that in the coming weeks. We also have our technology being used by MIT media Lab in their research. We also have it being used in a number of early-stage, concept level products. We have clients in the full lifecycle of our products. Someone has already launched to a number of different products like we have in robotics, employees, education apps, as well as poor English they would learning. We are also working on a pilot for an accessibility product as well, which is obviously [INAUDIBLE] voice enable to be able to open a webpage or move forward or back, to activate buttons basically using your voice. Quite broad in applicability. JOSH ANDERSON: For sure. Is there anything on the horizon? Anything you guys are working on for the future? DR. PATRICIA SCANLON: A number of things. We have this in English, so there is a number of different product areas we are working on. We will be shortly bringing out a fluency assessment. We will be shortly bringing out a systems rank dictation. We will be breaking out our suite of products in a number of languages. We will be starting with Chinese, Mandarin, Spanish and Portuguese, and a number of differently which is following. This is a global market, a global product. JOSH ANDERSON: Very good. If our listeners want to find out more about soapbox labs, how would they do that? DR. PATRICIA SCANLON: Can go to www.soapboxlabs.com. If you are interested in licensing the product that you can get in touch via a web form on our website or our email address. We would love to chat. JOSH ANDERSON: Doctor Patricia Scanlon, thank you so much for coming out to our show today and talking about soapbox labs and children’s voice recognition. Very cool, it’s something I don’t think a lot of people really had thought about. I’m glad you guys are filling that need. DR. PATRICIA SCANLON: Great. Thank you for having me. It was great to chat.